An exciting day for me today, as I found out that I’ve been shortlisted in the “Best Food Blogger” awards in the 2013 Food Magazine Reader Awards! This is a new category for this year’s awards, which celebrate the best that the South West has to offer in a number of food and drink-related categories. 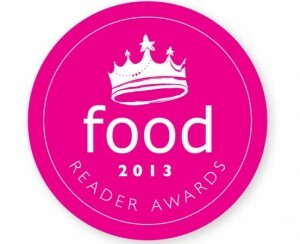 There are a number of categories in which to vote, including Best Cafe, Local Food Hero and Best Foodie Hotel. Bristol’s The Muset has been shortlisted in the “Best Restaurant” category, and their head chef Jethro in the “Best Chef” list. It’s also great to see local businesses Pieminister Pies, Yeo Valley Yoghurt and Marshfield Ice Cream in the “Best Food Product” shortlist.